Six o'clock rolled around this morning and I was less than enthusiastic about going back to work. But there is no better wake-up than twenty-two happy little faces greeting me with “bonjour!” And today was extra special because I received new whiteboard markers from Santa this Christmas (thanks mom) and finally got to use them today for my lesson (total geeky teacher-ness I know). 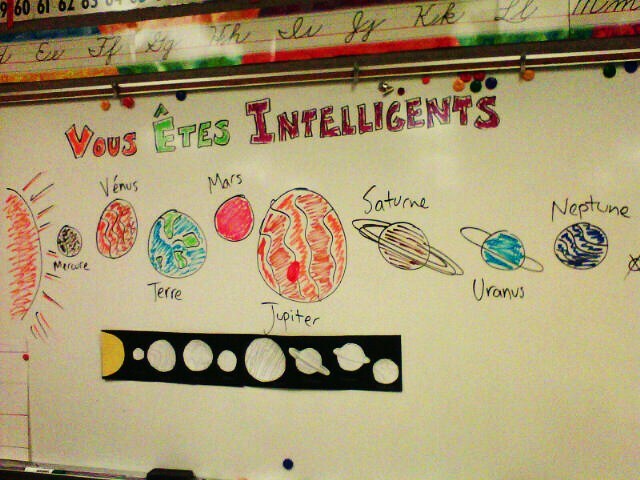 We are learning about Space in grade 3 Science in term two, and aujourd’hui we reviewed the order of the planets. If you’re wondering why it says << VOUS ETES INTELLIGENTS >> above – I try to write some inspirational thing on the board everyday! And you know, I think it works, putting up a message like that for them. My students were so amazing today! Most definitely intelligents. Hey! I like you! You can like me too on Facebook! I love your White Board! So colourful and fun, where were you when I went to school!? Do you speak to your students entirely in French? All the time? Every subject? I've always wondered that about French Immersion. You make me wish I had followed my childhood dream to become an Elementary School Teacher. Your outft est très adorable! You can always go back and get your degree! You should! You're probably the most stylish teacher! Adorbs! Cool shirt! Wow, I thought it was store bought. I had no idea you made it. You're very talented. You can sew, speak French, teach children... what else can't you do?! Hahaha. Anyway, I'm glad 2011 is off to a great start for you! Same for me as well. I feel like this is going to be a great year. New start, new beginnings, new chances to do the things we couldn't/didn't do last year.